Pack size: 1 x 10ml bottle. Review Blink Contacts Bottle A great product and always a must to have standing by!!!! Review Blink Contacts Bottle Gives a nice refreshing feeling after wearing the contacts for a long time, although the bottle is small and the price could be cheaper. All in all, it has done its job! Review Blink Contacts Bottle Really handy as my eyes tend to dry out towards the end of the day. Probably down to computer screens etc. I would recommend adding them to the contacts prior to putting them in, they're extra comfy that way! Review Blink Contacts Bottle Use contact lenses only when cycling and have found these drops to improve all aspect of use. I use one drop on the lense before putting them in. Improves initial comfort and my eyes haven't been sore/tired after. Would highly recommend. Review Blink Contacts Bottle Best drops on the market for contact lens wearers. Dry eyes can plague contact wearers. After hours of wear, lenses can become gritty, and can irritate the eyes, making computer use difficult and complicating the end of the working day. But there are solutions, like the Blink Contacts Bottle. Produced by global vision leaders AMO, the Blink Contacts Bottle contains eye drops which go to work in dealing with dry eyes, restoring comfortable vision in seconds. • Blink works by mimicking the action of the eye's natural moisturizer - tears. Using a preservative-free recipe, Blink Contacts Bottle provides instant moisture to the eyes in a way that will not irritate the body. This restores the all-important tear film, which retains moisture around the eye. • Using Blink is a popular route to improved comfort for lens wearers across the world. The eye drops ensure total convenience in work situations. • These drops are intended to be used by a wide variety of lens wearers, including those who need rigid gas permeable lenses and soft lenses. • Comes in a handy, easy to transport 10ml bottle. Whether you need excellent vision to focus on spreadsheets or textbooks, dry eyes can make life really difficult. 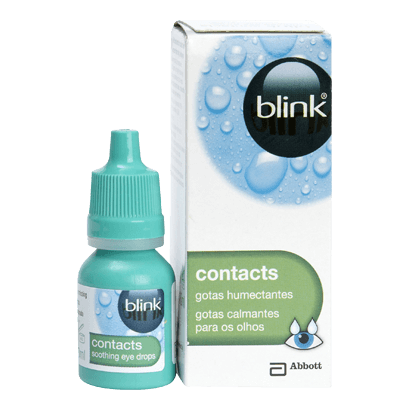 The naturally formulated, gently soothing eye drops provided by the Blink Contacts Bottle will provide immediate relief for dry eyes whatever the situation.